What’s new? It’s truffle month for July at Stellar at 1-Altitude, the restaurant with a panoramic skyline view of Singapore right below the renowned One-Altitude Bar. Helmed by Chef Christopher Millar, it is not Italian or French truffles we are talking about here. Instead, the chef and restaurant will be featuring truffles from the famous Manjimup truffle farm in Western Australia, where it is the peak of the winter truffle season in Australia currently. 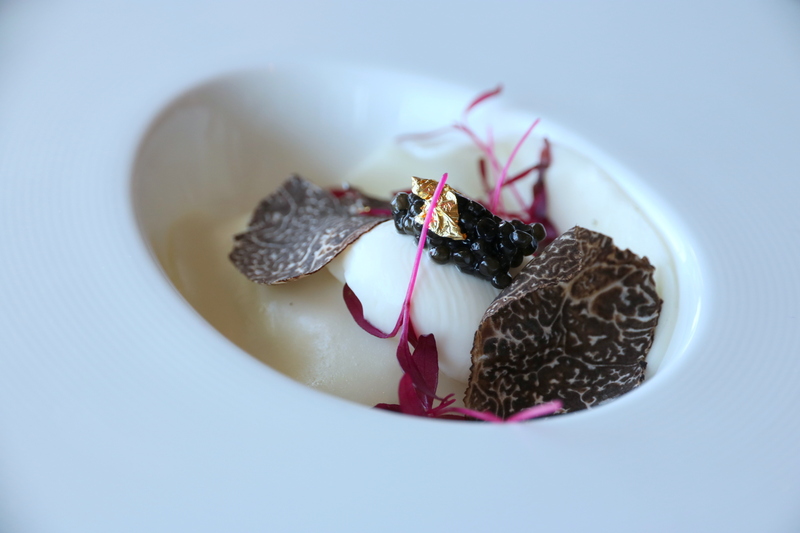 The Truffle Constellation Menu This special seasonal menu for the month of July will feature an 8-course all truffle menu (S$190++), with the option of wine pairing (additional S$95++). Some significant highlights for me include the Loch Fyne salmon tartare wrapped in Coriscan Valetta with wild asparagus, almond milk curd and black truffle; the Trufflee scrambled Japanese red egg with Sevruga caviar; Truffle latte paired with truffle macaron; and the Truffle risotto with poached Maine lobster and shaved winter truffles. Overall, I like it that the truffle flavours were showcased across the dishes in a sublime and subtle style, My favourites from the 8-course menu are the understated Truffle latte and also the Truffle risotto, cooked to perfect texture with fresh generous chunks of Maine lobster. Other truffle dishes to watch out on this menu include the Smoked gnocchi with black truffle and the Poulet noir with foie gras, celeriac and truffle butter. For dessert, I was expecting a truffle ice cream and true enough, I had the Madagascar honey truffle ice cream by pastry Chef Jasmin Chew as a perfect conclusion to this truffle meal.